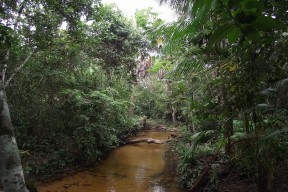 A typical igarapé habitat in Maranhão state, eastern Brazil. Hyphessobrycon: from the Ancient Greek υπελάσσων (hyphesson), meaning ‘of lesser stature’, used as a prefix in this case, plus the generic name Brycon. heterorhabdus: from the Ancient Greek ἕτερος (héteros), meaning ‘other, different’, and ῥάβδος (rhábdos), meaning ‘rod, wand’. Not explained but possibly in reference to the dark lateral stripe on the body, the main character used by the author to distinguish it from Tetragonopterus (currently Hemigrammus) schmardae, with which it was considered closely related at the time. Has been considered to range throughout the lower and middle Amazon basins as far as southern Colombia, but may be restricted to tributaries and coastal drainages in the eastern states of Pará and Maranhão, with the rio Tapajós representing its upstream limit (see ‘Notes’). The majority of records pertain to localities south and west of Belém, including the rios Guamá, Acará, Tocantins, and Xingu, plus some smaller river systems which drain directly into the Atlantic Ocean, such as the rios Marapanim, Caripi, Maracanã, Caeté, Gurupi, and Pindaré. 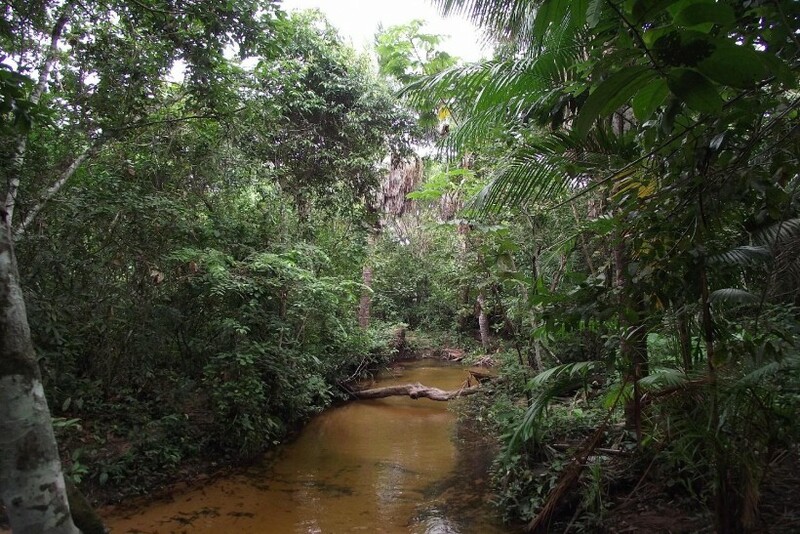 It has also been collected from various localities within the rio Tapajós, between its confluence with the Amazon and Jacareacanga in the middle part of the basin. It is not included in recent checklists of Colombian ichthyofauna (e.g. Maldonado-Ocampo et al., 2008), while records from Suriname refer to other taxa (Mol, 2012). Type locality is ‘Pará, Brazil’. Almost exclusively collected from small streams known as igarapés in the Amazon region, and appears to be a typical resident of terra firme (not subject to long-term annual flooding) headwater tributaries east of the rio Tocantins. Such habitats are typically shaded by forest cover or riparian vegetation and contain clear water with substrates of sand or mud and submerged tree roots, fallen branches, and leaf litter. Aquatic vegetation is not usually present. It is best-maintained alongside similarly-sized characids, gasteropelecids, lebiasinids, smaller callichthyid or loricariid catfishes and non-predatory, small-to-medium-sized cichlids. Sexually mature females are noticeably deeper-bodied and a little larger than males. 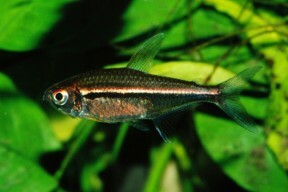 This species is also known as ‘Belgian flag tetra’ in the aquarium hobby. Its name appears to have been misapplied to similar-looking fishes occurring throughout much of the middle and lower Amazon in Brazil and Colombia, the rio Orinoco drainage in Colombia and Venezuela, and coastal systems of the Guianas. Some of these populations have been described as distinct species (e.g. Hyphessobrycon amapaensis Zarske & Géry 1998; H. eschwartzae García-Alzate, Román-Valencia & Ortega 2013; H. montagi Lima, Couthino & Woziacki 2014), whereas the identity of others remains unclear (e.g. H. sp. ‘blackstripe’ from Suriname, H. cf. heterorhabdus from Venezuela). H. heterorhabdus differs from all of these in some aspects of meristics and morphology, but may be distinguished from the three described species by colour pattern. The dark lateral body stripe is continuous between humeral spot and caudal peduncle (vs. reduced or absent towards caudal peduncle in H. amapaensis), there are no yellow to orange markings in the fins (vs. such markings present in H. eschwartzae), and it possesses only a single humeral spot (vs. two distinct humeral spots in H. montagi). H. heterorhabdus lends its name to the putative ‘H. heterorhabdus-group’ of closely-related species within the genus as proposed by Géry (1977). This originally comprised around 15 members characterised by a ‘longitudinal pattern’ consisting of a thin, usually dark, lateral body stripe, but has since been modified on a number of occasions. Preliminary descriptions of some new South American Characinidae. 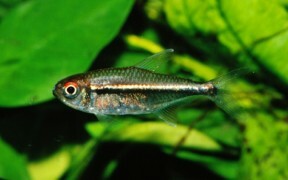 Hyphessobrycon taphorni y H. eschwartzae (Teleostei: Characidae) dos nuevas especies de peces de la cuenca del río Madre de Dios, Perú. Hemigrammus ataktos: a new species from the rio Tocantins basin, central Brazil (Characiformes: Characidae). The Freshwater Fishes of Suriname. Hyphessobrycon amapaensis spec. nov., eine neue und mutmassliche Stellvertreterart von Hyphessobrycon heterorhabdus (Ulrey, 1894) aus dem Bundesstaat Amapa in Brasilien (Teleostei: Characiformes: Characidae).